When it comes to South Maui beaches one should look no further than Keawakapu beach, also known to locals as sidewalks. While Keawakapu Views has no swimming pool on property, with Keawakapu beach across the way, you have the Pacific Ocean as your pool! Keawakapu Beach is just a short walk away and you are able to make the most of your time on the Valley Isle in the water or on the golden beach. Keawakapu's magnificent soft white sand and playful waves are world renowned. There are vendors along Keawakapu beach that rent out various beach equipment including snorkel equipment, stand-up paddleboards, and kayaks. Popular dining hotspots Sarento's On The Beach and the Five Palms restaurant are both overlooking the beach for spectacular beach front dining that is hard to beat! Keawakapu Views vacation rentals are thoughtfully appointed with all the necessities you could need for this tropical getaway. You will find the comforts of home surround you at your home away from home when you arrive back at your condo from a day exploring the island of Maui. 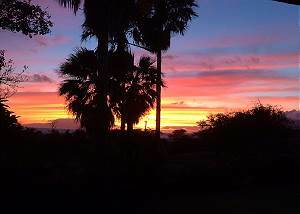 Sit back, relax, and unwind as the another beautiful Hawaiian sunset unfolds from your lanai. The beautiful colors will streak across the sky as you hold up your Mai Tai and cheers another great day on your dream vacation staying at Keawakapu Views. Come rest and relax at Keawakapu Views for an amazing stay on Maui!